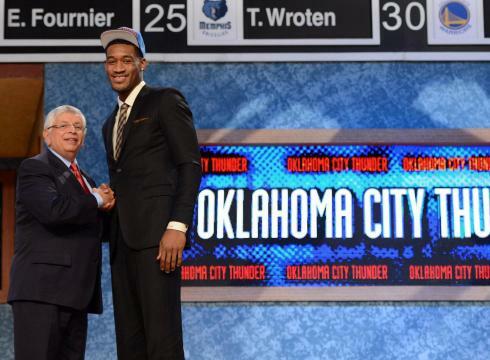 The Oklahoma City Thunder hold 3 draft picks in this upcoming draft. They have two in the first round, No.12 and 29, and one in the second round, No. 32. While people are usually enamored by the first round picks, it’s the early second round picks (No. 31-35) that hold more value to teams. It’s an opportunity to grab first round talent without the constriction of a guaranteed contract. Here’s a list of notable players that have been drafted in the 31-35 range in the last 5 season: Nikola Pekovic, Mario Chalmers, DeAndre Jordan, Kyle Singler, Jeffery Taylor, Jae Crowder, Draymond Green. The difference in talent from the last 5 picks of the first round and the first 5 picks of the second round is infinitesimal. For teams holding a slot in those first 5 picks of the 2nd round, it is an opportunity not only to draft a talented player, but also to procure a trade for an asset. The fact that a team can take a flyer on a player without having to offer a guaranteed contract, makes these picks more valuable than those in the lower end of the first round. These picks becomes doubly valuable before the beginning of a maddening free agency season. When teams vying for free agents want to clear cap space and/or not take on anymore guaranteed salary, they dump players and first round picks in exchange for high second round picks. Thunder general manager Sam Presti took advantage of this during the last frenzied free agency class, where he also owned the 32nd pick. We arm-chair GM’s love to talk about the would’ves, could’ves, and should’ves. But we have that beautiful thing called hind-sight in our back pockets. Real NBA GM’s don’t have that advantage, but those few great GM’s have a little thing called foresight. While we focus on our team in the present tense, great GM’s look at the health of other franchises and plot how they can take advantage of their needs. 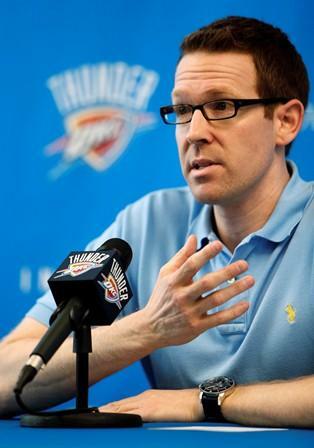 Presti is great at this and seems to be on the prowl again in this draft. 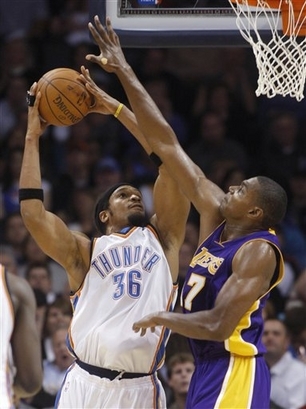 On July 27th, 2009, the Thunder traded Damien Wilkins and Chucky Atkins to the Minnesota Timberwolves for Etan Thomas and 2 second round picks. Most people thought this was just one of those offseason trades where a team trades 2 bench players for another bench player. But the haul in that trade was actually the 2nd round pick that turned into No. 32 in the 2010 NBA draft. The 2010 offseason was known for one thing and one thing only….the summer of Lebron. That was the offseason where most of the bumper crop from the 2003 draft class was coming up on their 2nd extensions, while other players like Amare Stoudemire, Carlos Boozer, and Joe Johnson were also coming up on unrestricted free agency. If you were a team that believed in quick fixes, this was the summer for you. While a handful of teams were trying their hardest to unload as much salary as possible, the other teams were more than willing to take on decent players (salary) and first round picks. The Thunder had assets galore in the 2010 draft with 3 picks in the first round (18, 21, and 26) and 2 picks in the second round (32 and 51). The consensus with most teams is that you don’t head into training camp with five rookies. So, the Thunder knew they had to wheel and deal to get what they wanted in this draft, which was a defensive minded big man and more assets. Their first move was to trade the 32nd pick to Miami for the 18th pick and Daequan Cook. Miami was looking to cut salary to position themselves for the summer of Lebron. The Thunder knew they couldn’t get what they wanted at 18, so they traded it to the Clippers for a future first rounder. They eventually traded up to the 11th pick where they picked Cole Aldrich. The future first rounder from the Clippers helped to facilitate the trade with the Boston Celtics for Kendrick Perkins at the trading deadline that following season. There are a lot of similarities between this offseason and the 2010 offseason. First off, the top tier in this free agency class includes some franchise players, such as Chris Paul, Dwight Howard, Andrew Bynum, and Josh Smith. Secondly, these free agents are available and willing to hear out every offer on the table. Thirdly, there are team already vying to dump salary and 1st round draft picks to clear cap space. And, fourthly, the Thunder have the 32nd pick. The story behind the 32nd pick is akin to the story of Hebrews wandering in the desert for 40 years in the book of Exodus. A little bit of controversy, a little bit of disobedience, and finally back to where it ultimately needed to be. On December 19, 2011, the Thunder traded Byron Mullens to the Charlotte Bobcats for their unprotected 2013 2nd round pick. Simple, right? Wrong! When the Thunder traded for Perkins, they sent Nenad Krstic and Jeff Green to Boston along with that Clippers draft pick. Everything was going good until doctors discovered the following season that Green was suffering from an aortic aneurysm, would need immediate surgery, and would miss the entire 2011-12 season. Boston contended that Oklahoma City knew of this condition previous to the trade. On June 16, 2012, the NBA decided to give Boston the Charlotte pick as compensation for the Green debacle. On July 20, 2012, the Celtics traded the pick to the Houston Rockets as part of a three team trade for guard Courtney Lee. Finally, on October 27, 2012, the pick was sent back to Oklahoma City as part of the James Harden trade. I’ve joked that, to everyone outside of Oklahoma City, the trade between OKC and Houston will be known as the James Harden trade. But to the people in Oklahoma City, the trade will be known as the “reacquisition of the Charlotte 2nd round pick” trade. Oklahoma City is in prime position to make a significant move to improve their team in this draft. The rumor mill is already rampant with teams wanting to dump salary and picks for a chance at one of the top tier free agents. Adrian Wojnarowski of Yahoo!Sports reported that Houston is looking to unload the No. 5 pick from last season’s draft, Thomas Robinson, in order to clear further cap space. Chad Ford of ESPN.com reported that the Dallas Mavericks were looking to trade away the No. 13 pick in order to avoid the $1.6 million cap hold that the pick carries. Also, Atlanta has picks 17 and 18, but are also looking to throw their hat in the free agency fray. There will be plenty of opportunities to nab a necessary piece on this draft day. Also, there is one more thing to look out for in this draft. There might be an epic free agency class coming up next offseason. 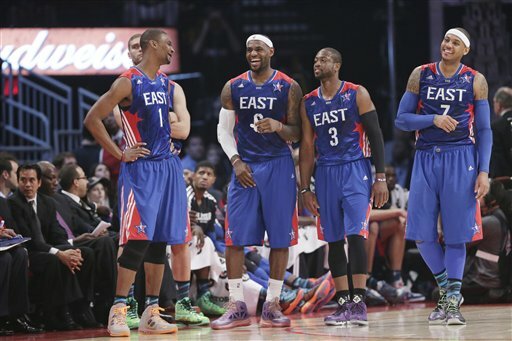 Lebron James, Carmelo Anthony, Chris Bosh, and Dwayne Wade all have early termination options to become free agents in 2014. Add to that, the 2014 NBA draft is predicted to be a lot stronger than this draft class, and you have the perfect storm for further wheelings and dealings. Look for the Thunder to not only get what they need in this draft, but also to pick up assets for the 2014 draft. Let the madness begin!